iPhoto is without a doubt the best tool to organize all your photos. And now with Sync for iPhoto you can synchronize all your photos on multiple computers, external disks, network drives, etc. 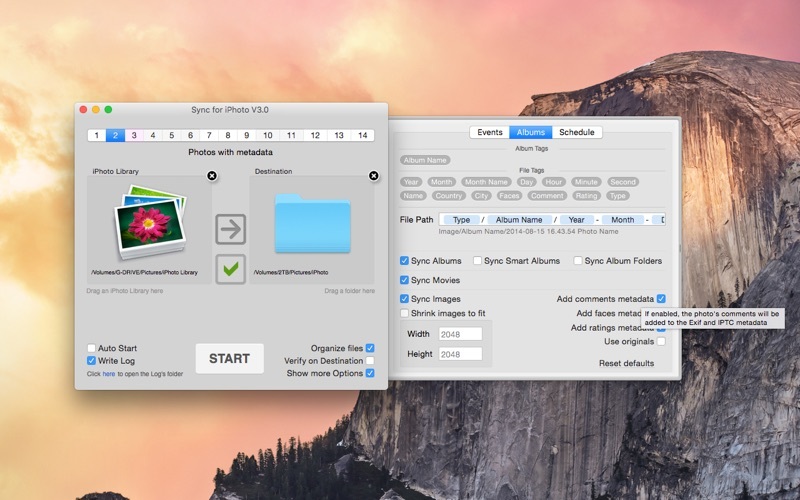 Sync for iPhoto is very easy to set up, simply drag the folder in which you want to create a copy of your library and your done. You can create exact copies of your libraries if you want to access it from another Mac. Or, you can choose to organize all your photos and videos neatly in folders for easy access from any device. Pressing the big START button will start the synchronization. 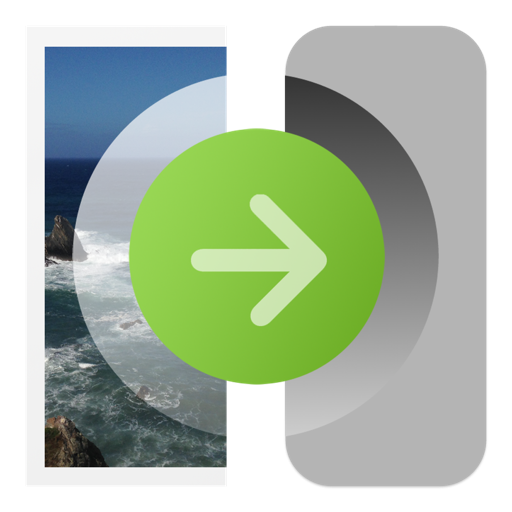 After adding more photos to your iPhoto library, simply run Sync for iPhoto and in a few minutes, the new photos will be copied to where ever you want. You can also setup scheduled synchronizations weekly or repeatedly every x minutes. ▪ Create backups on 14 preconfigured folders. ▪ Organize all your photos and videos in folders for easy access from media players, Windows, PlayStation, XBOX, etc. 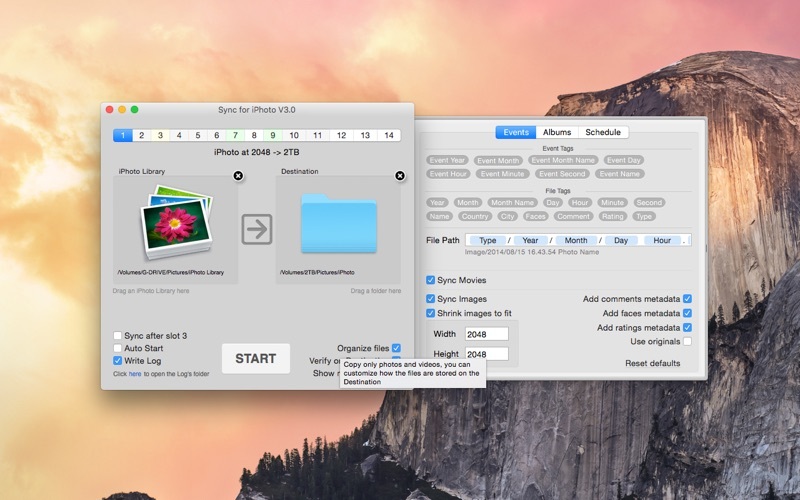 ▪ Create exact copies of your iPhoto Library and access it from other computers. 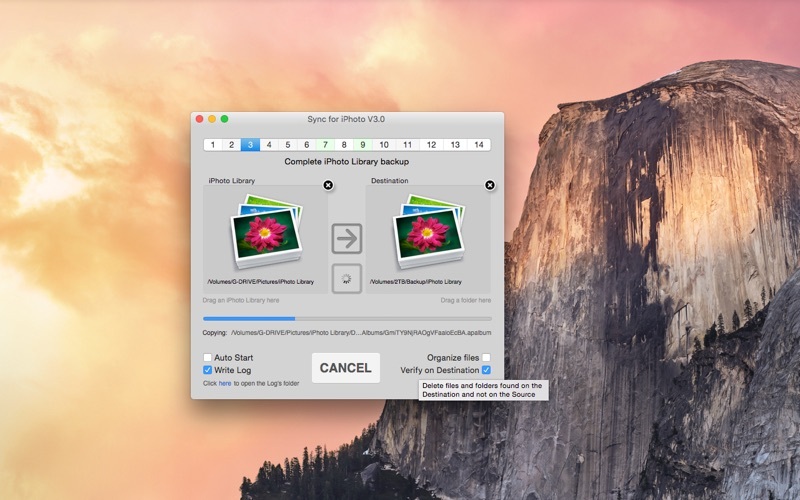 ▪ Combine photos from several iPhoto Libraries by selecting "Organize files” and turning off “Verify on Destination"
▪ Synchronization is fast and efficient. ▪ Filters can be added to choose exactly what to synchronize. ▪ Easily queue slots to be synchronized one after another. ▪ Option to delete files on the destination that no longer exist on the source folder. 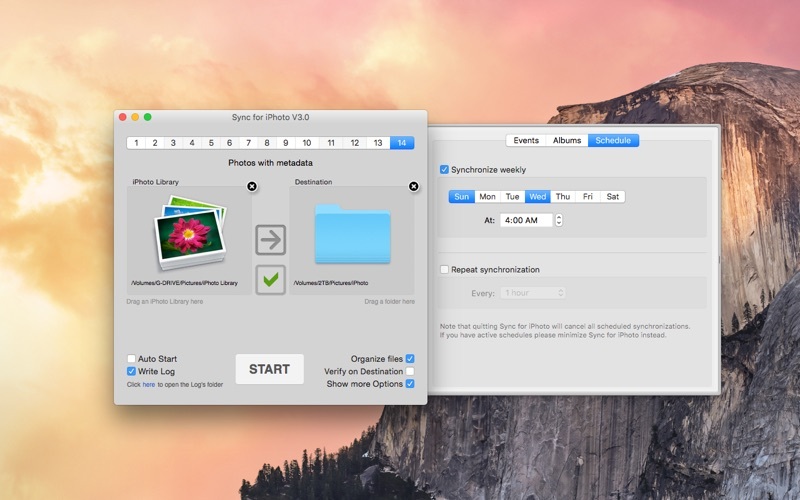 ▪ Option to start copying as soon as Sync for iPhoto is executed. (useful for creating schedules to run this tool from iCal for example). ▪ Option to write on log files all the operations perform during the synchronizations. ▪ Safely cancel synchronization at any time. You have the option to continue next time you synchronize. ▪ Perform multiple synchronizations simultaneously. ▪ Follow folders in case the name or location has changed. ▪ Scriptable, all actions can be automated using Apple Script. ▪ Resize images to fit your preferred width and height in pixels. ▪ Option to copy the original images instead of the modified ones. ▪ Lots of options and yet extremely simple to use. • What exactly does the option "Organize files” do? If you want to have a copy of all your photos and videos on a NAS drive, to easily browse from any device, then you should definitely try turning this on. You can define exactly how to organize your events and albums. There are several tags that you can use to specify the path according to your needs. • Should I always use the option "Verify on Destination" ? No. For very large backups it is recommended to switch it OFF, and possibly turn it ON once a month to clean older files. Also if you want to mix libraries this should be OFF. • Is it safe to cancel an ongoing synchronization? Yes. You can cancel at any time. The operation will only terminate after the current file. Quitting the application will immediately stop all processes. This may cause files to be incomplete on the destination folder. All files will be completed on the next synchronization. • Will the window's close button cancel the synchronization? No. It is always safe to close the window. The application will only quit if there are no ongoing synchronizations. Keywords on photos are now separated with a comma ","